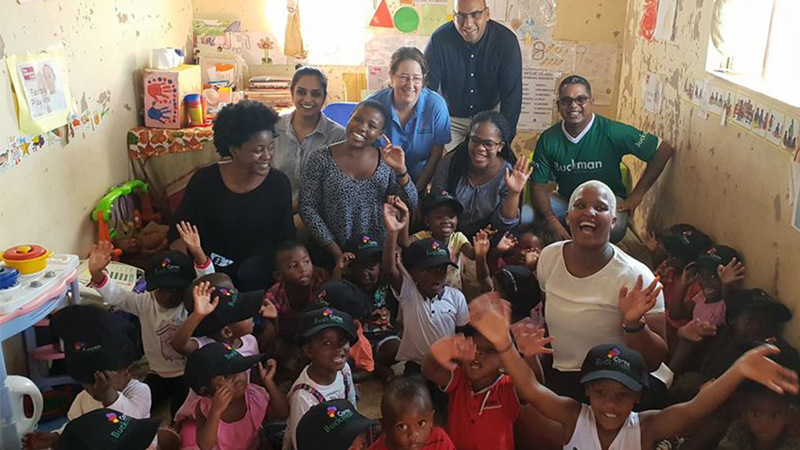 Today, Buckman Labs Durban branch joined us at Thandolabantwana Creche – the site of our #BuyABrick2019 campaign – to celebrate their annual BuckmanCares Day, which is “a global community engagement initiative, that dedicates Buckman resources – both financial and human – to improving education for youth, enhancing health and human services, and bolstering environmental stewardship. These efforts make our communities more livable. They earn the respect and goodwill of others…. And they provide unique opportunities for personal growth and fulfilment for our associates”. Treating all the children to a few hours of love interaction and playtime as well as lunch and treats, Buckman also donated new outdoor play equipment such as hoolahoops, balls, toys, storage boxes generously donated by PailPac filled by Buckman with the children’s creche daily essentials – soap, facecloth, toilet-paper, blanket, stationery, porridge, wet-wipes etc – each child was also given a bag of non perishable food items to take home. What a beautiful day! Thank you so much Buckman for your generous support for these litles ones and to Ant Asherwood for helping us to cart the goodies to the creche.